Since we know the old saying “a picture is worth 1,000 words,” here’s a photograph to sum up last night’s Yankees 7-4 win over the Cardinals. Shelby Miller allowed all 7 runs on 9 hits with 2 walks and a strikeout. For the Cardinals on offense, they had 13 hits — one more than the Yankees. They also left 13 on base and were 3 for 15 with runners in scoring position. Kolten Wong did go 4 for 5, however, and drove in a run in the 8th. In the bottom of the ninth, the Cards had a chance as Allen Craig singled and Yadier Molina was walked by Yankees closer David Robertson. 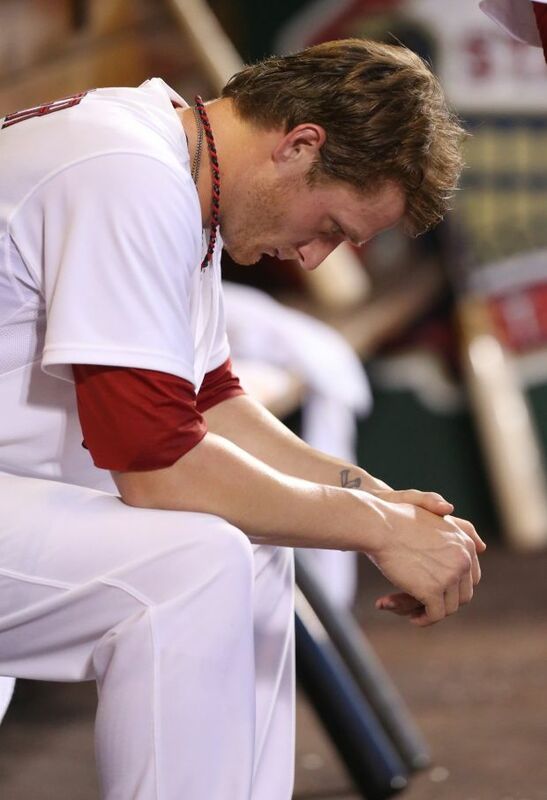 But then Jon Jay, pinch-hitter Matt Adams and Daniel Descalso each struck out. Yet, according to Mike Matheny in this article from Jenifer Langosch, that was all just fine. Yay! Good at-bats — with three K’s in a row! Juice boxes for everyone! The San Francisco Giants are in town tonight to start a four-game series at 7:15 p.m. If it seems like it’s been a while since the Cards played them, it has — their last games were almost exactly a year ago, with a doubleheader on June 1, 2013, that the Cardinals swept and a loss the next day in which Yadi had a memorable outburst. But, yes, the Giants are 34-19 and obviously in first place in the NL West. As for their road record, it’s 15-10 … so not exactly terrible. At least the Cards home record is now 15-9. Tonight’s pitching match-up is Ryan Vogelsong vs. Jaime Garcia. This entry was posted in 2014 Cardinals and tagged Kolten Wong, Mike Matheny, New York Yankees, Shelby Miller by Christine Coleman. Bookmark the permalink.